For those who want to fly their own parachute from their very first jump or learn to skydive the ‘traditional’ way – the static line parachute jump is ideal. 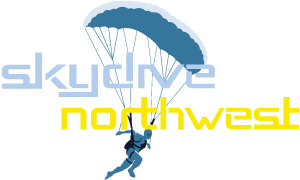 It’s low cost, exciting and if you want it to be – a genuine step towards learning to become a skydiver yourself. Your first parachute jump is from 3,500 – 4,500 feet and your parachute will automatically deploy as you fall away from the aircraft using a device called a ‘static line’. 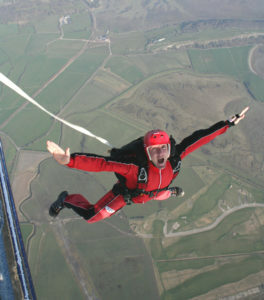 It’s a great and ‘hands on’ alternative to a tandem skydive. You will fly and steer your parachute to the landing area after having received extensive training and with the support of a radio attached to your helmet. You can then move towards experiencing freefall by making additional parachute jumps from higher and higher altitudes. You will receive approximately 6 hours of extensive training on the ground after which you will make your first parachute jump. You are provided with everything you need to make that first jump. After your first static line jump you can develop your parachuting skills by making more and more jumps from higher altitudes and by following a training system called the “category system”. The weight limit is 15 stone. The minimum age is 16. Anyone under the age of 18 must have parental consent. The maximum age is 54. People aged 55 years or over cannot participate in solo parachute training. Everyone must complete a declaration of fitness to parachute. People who have suffered from any of the medical conditions listed on Form 115C must be certified as fit to skydive and have Form 115D signed by their GP.